Introduction (this is an update of a 2015 post). I have never written a blog-post about a TV series or a movie; and, that is not my intent now. But what if a TV mini-series (not a documentary) has a plot that uses the Bible and the Mishna (the collection of Rabbinical oral saying of Judaism) to write its story-line? Six months ago, I started writing a post on the red heifer of Numbers 19. I never finished it. The mini-series gave me the push I needed. Who would imagine that the building of the 3rd Temple on the Temple Mount could hinge on ashes of a female red cow, a biological anomaly, mixed with the spring waters of the Siloam Spring and sprinkled in a precise way by a ritually pure modern-day Levitical priest (there are none today)? USA Network mini-series, “DIG,” premiered on March 5, 2015, and champions an end-of-days conspiracy pitting Jewish and Christian apocalyptics, surprisingly working together to reach the same end-goal — the coming of Messiah. Of course for Jews, the coming of Messiah will be for the first time, and for Christians, the coming of Jesus Christ will be for the second time.1 The two apocalyptics are headed in a parallel yet divergent end-game, each a partner with the other, to hasten the coming of Messiah. The prophetic fulfillment for both paradigms will require the building of the Third Temple on the Temple Mount. 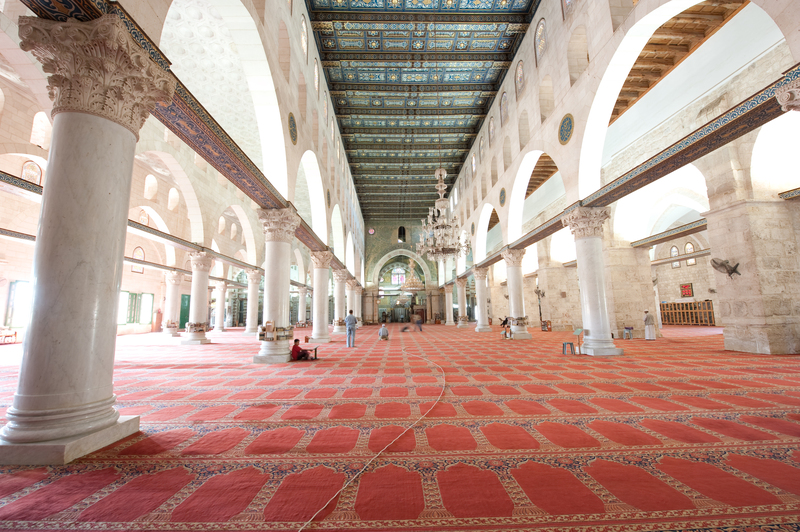 As most are aware, the Temple Mount is under the control of a Jordanian charitable trust (called “waqf”), and its Arab trustees maintain and control the Mount and the two religious structures, thereon, the Dome of the Rock and Al Aqsa mosque. Israel is responsible for security on the Temple Mount. Jews may visit the Mount but they cannot pray upon it. Arabs, through the Jordanian charitable trust’s ownership of the Mount, claim sovereignty over the Temple Mount. 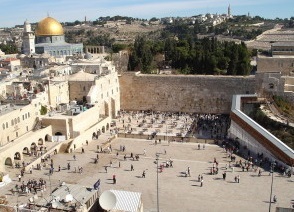 Therefore, any attempt to rebuild the Temple in the modern-day will require Israel to claim sovereignty over the Temple Mount, an act most certainly leading to the destruction of both the Dome of the Rock and Al Aqsa Mosque, and a near-guarantee of the beginning of World War III.2 Palestinian Arabs have long eschewed any Jewish claim to the Temple Mount, and in fact, have claimed East Jerusalem to be their future capital of the future Palestinian State (where the Temple Mount is located). DIG is Hollywood’s version of Arab and Jew claims to the holiest and most contested ground in the world, the Temple Mount, and how apocalyptics could play into a precarious balance of Arab and Jewish claims over the same piece of ground. The TV mini-series. The mini-series has all the trappings of the CIA thriller, “24,” eve n to its own “Jack Bauer type” — played by Golden Globe nominee Jason Isaacs, starring as “Peter Connelly, an FBI agent stationed in Jerusalem, who, while investigating a murder, “uncovers a conspiracy 2,000 years in the making.” A young, spirited, red-haired female archeologist (played by Alison Sudol) discovers the Siloam Spring in the underground caverns of the Temple Mount, along with a dried bone fragment, the DNA of which is determined to be that of a cow (apparently signifying the location upon which the red heifer was sacrificed in ancient days). In Hollywood fashion, the red-haired archeologist engages Peter Connelly, the FBI operative, in a seductive encounter in the secret, sealed-off underground caverns of the Temple Mount and its pure Siloam spring waters. The archaeologist is mysteriously murdered by an unknown assailant for a reason the audience has yet to discover. The mini-series rightfully earns its acclaim as a mystery thriller as Connelly begins his search for the murderer. When one puts the two plots together – a murder mystery and an ancient biblical rite of sacrifice, the viewer is drawn into the plot of unknowns — need the DaVinci Code move over? The unraveling of this mystery through ten episodes will lead both the uninformed and informed viewers through the suspense, mystery and intrigue that Hollywood is best known for; but for the informed prophecy student, each episode will draw upon eschatology and a sensitive eye to current events around the world, many of which take place in Jerusalem, the Biblical “center of the world.” Ezekiel 5:5. The holiest city on earth has an unholy secret . . . When Peter Connelly, an FBI agent recently stationed in Jerusalem, begins investigating the murder of a young American, he realizes that he has uncovered an ancient international conspiracy that threatens to change the course of human history. Certain that the dangerous prophecy is nearing fruition, Peter must race against the clock to unravel its mystery. From a remote farm in Norway, to an enigmatic compound in New Mexico, to the serpentine tunnels of Jerusalem, this immersive, fast-paced adventure will take viewers on a quest for a truth that will shake the world’s beliefs to its very core. Trailer here. The red heifer. I have watched the first four episodes, each of which has depicted an amazingly accurate account of the apocalyptic significance of the “unblemished red heifer” in Judaism (Numbers 19:1-2), and by extension, to Arabs, Christians – and ultimately, the world. This female red cow is the rarest of animals, and in fact, none are known to have existed since the destruction of the Temple by the Romans in 70 AD (and the Jews have been looking for one ever since). The Mishna, the compilation of Rabbinical oral law for Judaism, contains a tractate on the red heifer entitled, “Parah” (Cow), in the 6th Division, “Tohoroth.”3 The rarity of the red heifer is due to the requirements of Scripture (as elaborated by the rabbis in the Mishna) that it be “without defect,” i.e., “unblemished,” without more than two strands of hair, a color other than red,4 on which no yoke has ever been placed (Numbers 19:1-2), and not more than two years old.5 In the mini-series, the red heifer is named, “Red,” and is raised on a remote farm in Norway. Red’s caretaker is a Jewish young man who seems to have little knowledge of Red’s importance but that he has been chosen to keep the animal safe, and in an unexpected turn of events, to deliver the heifer to a yet unidentified location, presumably Jerusalem. Red’s importance lies not only in his unblemished condition but also in the fact that Red is presumably the 10th red heifer in Judaism (a fact not yet revealed in the mini-series). According to the Mishna, Parah 3.5, there have been only nine qualifying red heifers slaughtered in the period extending from Moses to the destruction of the Second Temple.6 The 10th is prophesied to precede or accompany the coming of the Jewish Messiah. One tradition holds that the Messiah will literally burn the red heifer carcass “outside the camp” for its ashes (Numbers 19:3). Regardless, it is quite interesting that this requirement (outside the camp burning) is the one criteria that can be satisfied in the modern-day. The Temple does not exist. The heifer will not need the Altar of Sacrifice in a newly built Temple to be fulfilled because its neck is broken and its carcass is burned outside the camp. However, remember, that even if the red heifer were located, the ashes of the red heifer cannot be secured because there is no priest who is ritually clean to perform the rite of cleansing. The Jewish laws of purity. Perhaps a little detail on the Jewish laws of purity will help understand the significance of the red heifer. In Judaism, “ritual impurity” (or defilement) is of grave importance to orthodox Jews. When the Temple was still standing, ritual purity laws prohibited an unclean person from entry into areas of the Temple or participating in Jewish feasts until they underwent ritual cleansing. (Leviticus 12:7-8). Anything an unclean person touched was rendered unclean by contact (Leviticus 5:2-5, Leviticus 11:8). Herein lies the problem. Today, there is no means of ceremonial cleansing because there is no Temple; so everyone is ritually unclean, defiled, including the priests. Further, there are no clean utensils for service in the Temple. Any unclean utensil that is touched automatically renders a person unclean, including the priest who is performing the priestly service. Returning to the TV miniseries. This priestly “state of impurity” that “all Jews are stuck in” is one of the parallel steps taken in the mini-series not by Jews but by Christians! A Christian cult is introduced located deep in the deserts of New Mexico, USA. Actor David Costabile is the leader of the cult whose purpose is singular: to raise a ritually pure Levitical priest, a boy whose feet will never touch the soil until he is 13 years of age and completes his bar-mitzvah. Ritual purity is only possible if the boy is born in a ritually pure stone structure (stone did not transfer uncleanness if touched), built according to explicit Jewish requirements to insure the absence of contact with impure soil, and the boy lives there, isolated, until his 13th year.12 While being raised his entire life in the facility, the boy will be taught the laws of the Levitical priesthood. He will be schooled in the slaying of the calf, thereby preparing him for the day when he will leave the New Mexico facility, make his way to Jerusalem, where he will slay the red heifer, according to the laws of the red heifer sacrifice (Numbers 19:4-7). Why would a Christian cult in New Mexico have any interest in working with Jews in Israel to raise a boy to fulfill the laws of the Levitical priesthood? There is but one reason: To hasten the second coming of Messiah, Jesus, that is, to hasten the rapture of the church, that event prophesied by Scripture as a “catching up” of the Church to heaven by Jesus. 1 Thessalonians 4:16-17 NASB. Some Christians believe (not your’s truly. Read more) that the rebuilding of the Temple is the precipitant to the rapture of the church. Under this view, Jesus cannot return (2 Thessalonians 2:1) until the “man of lawlessness,” i.e, the antichrist, “takes his seat in the Temple” (2 Thessalonians 2:3-4). The antichrist cannot takes his seat in the Temple until the Temple is rebuilt. Hence, Christians of this view, will assist in anything that will allow the Temple to be built sooner than later. If many Christians believe the Temple must be rebuilt before the rapture occurs (not your’s truly! ), and Orthodox Jews believe the Temple must be rebuilt before their Messiah (not Jesus) appears, can you see why the two groups might work together to bring the red heifer to Jerusalem where a ritually pure priest will perform the sacrifice? In fact, the combined efforts of both Orthodox Jew and Christians seeking a parallel end-game makes complete sense even though each has a different apocalypse. Both groups believe their version is the correct one and so it is irrelevant that there are different views. This is enhanced by the belief of many Christians that the 2nd coming of Jesus Christ will be the time when Jews repent of their unbelief in Jesus and accept Him as Lord and Savior. Zachariah 12:9-10, Romans 9:27, Romans 11:25-29, Ezekiel 39:27-29. Recent events. Do you remember reading about the attempted murder of Rabbi Yehuda Glick, who was shot last Fall in Jerusalem. (Read more.) Rabbi Glick is a Temple Mount prayer-rights activist who fosters Israel’s building of the Third Temple on the Temple Mount. His attempted assassination occurred on the morning after he made a speech at an event in Jerusalem entitled, “Israel Returns to the Temple Mount.” After Glick’s attempted assassination violence ensued and the Temple Mount was closed for a time to settle Palestinian and Jewish unrest. The movement in Israel of Jewish prayer-rights on the Temple Mount is not one limited to activists, but is encompassing larger and larger segments of the Jewish population. Rabbi Yehuda Glick on Sunday, May 22, 2016, was sworn in as a Member of Knesset in the Likud party, a development that Temple activists celebrated. Conclusion. Are we approaching the rebuilding of the 3rd Temple? Are we approaching the unfolding of prophetic events that will likely close the age that we live in? Even Hollywood seems to think so. The most amazing thing is that it all hinges on a female red cow! NextDoes Scripture Require the Building of the 3rd Temple before Jesus Returns? <>. To clarify, the heifer is female. Jesus’ sacrifice canceled the ordinances (minutiae of the Torah and Mishna re. purification and qualification for Heaven) against believers in the One True God, so all the straining to hasten his return by sacrificing a red heifer and purifying and rebuilding the Jewish Temple is powerless ad void, an affront to the work and purpose of God in Christ and a stench in His nostrils. Thanks for your comment. Have a blessed Easter. I believe the red heifer was sacrificed on the Mount of Olives and so I don’t believe a bone would be found under the temple mount. How would the ritually clean 13 year old be transferred to Jerusalem from the U.S. without becoming ritually unclean? To Cece….According to Mishna Parah iii 2-5 it says: “And they bring oxen, and on them are doors, and the youngsters sit on top of them, with cups of stone in their hands. `[When] they reached the Siloam, they descended and filled them, and mounted and sat on top of them.” It is possible to transport this child (13yr old) on a heavy transport aircraft such a military C130. So this child would have to ride on a wooden type door mounted on the top of an oxen from the USA to Israel then to the pool of Siloam . Alfred Edersheim in his book “The Temple Its Ministries and Service, Chapter 18 On Purification wrote the following…”The child was to ride on a bullock, and to mount and descend it by boards. He was first to proceed to the Pool of Siloam, * and to fill a stone cup with its water, and thence to ride to the Temple Mount, which, with all its courts, was also supposed to be free from possible pollutions by being hollowed beneath.”….Sounds crazy, but it is doable. right Rey but you have to get him to the transport from his place of protection keeping him pure…keep him pure in the transport and get him off of the transport to Jerusalem and to the proper place. It would take a lot of planning and practice to make sure nothing touches him. Doable under perfect circumstances….better have a substitute on the side!